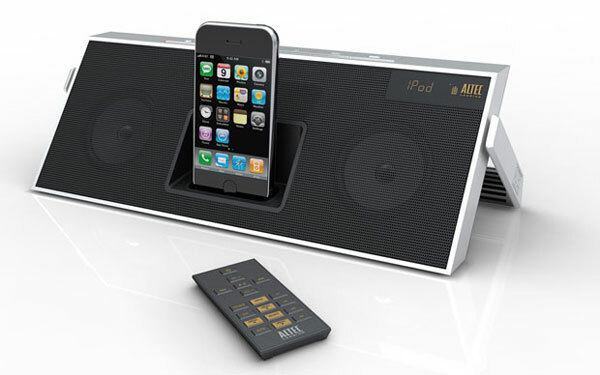 Check out this new inMotion Classic iPod, iPhone dock with built in FM radio from Altec Lansing. Being compact and lightweight, the inMotion Classic folds to the size of a small book and the handle doubles as the units stand when not being carried. It comes supplied with a rechargeable battery. It works with iPhone” certification eliminating the need to switch the iPhone to airplane mode. Rechargeable battery – Five hours of rechargeable freedom. Full-feature remote –Complete control over menu and music options. Audio Alignment™ – Drivers, enclosure and electronics are balanced for optimum sound. Expanded Sound Stage – Project your music far and wide. Interference Free – Unique design is immune to mobile phone interference, eliminating the need to switch to airplane mode.